It’s so important to keep Easter Christ-centered, and I am always looking for crafts and activities that focus on the true meaning of Easter for my kids. Here’s a round-up of some of my favorite ways! First of all, if it’s still Lent, you can find my Lenten resources for kids here. This includes ideas for celebrating Ash Wednesday, Palm Sunday, Holy Thursday, Good Friday, and so much more! Make a candy resurrection centerpiece. Super fun and easy! Make some marbleized shaving cream eggs straight in the egg carton! Make an Easter egg cross and fill it with jelly beans! 6 creative ways to teach the Easter story! 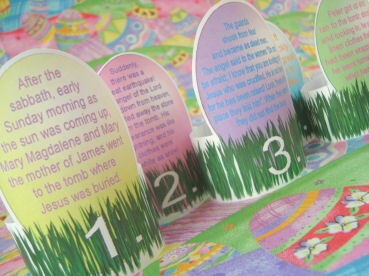 Make a Resurrection set for your kids- it’s easier than it looks! Just paint the heads and the rest is Mod Podged on. Also, check out my Passion set. Craft some easy Easter crosses using leftover egg dye! Check out this Symbolic Easter Tea for kids! Easy Easter tomb craft using a plastic egg and Easter grass- so fun! Try making some Resurrection Rolls. These are very easy and fun to make! Such a fun craft for learning about the real meaning of Easter. I have a printable recipe with the scripture verses included! all 50 days of Easter! Make a set of Resurrection Eggs with your kids. Another variation of Resurrection eggs- Stations of the Cross eggs. for your family to use at home. Print my Resurrection Napkin Rings! Story to be read by your table guests before eating. empty tomb treats for kids! Melt Your Own Candy Cross Pops from Jolly Ranchers! Easy cross craft for any age. Fun salt paintings- also great for every age! This oil pastel cross resist project is super accomplishable! How to color your deviled eggs for an Easter celebration! Transform your Lenten crown into a beautiful Easter nest! Make Rainbow Resurrection rolls using peeps! Easter Notebooking Pages- Free To Print! The Easter Legend of the Dogwood, and a craft to go with it. And be sure to check out all of the rest of my cross craft projects here! Learn about the risen Jesus at the shore in Tiberias and make this toss your nets to the other side goldfish snack. Religious Easter Ideas- fun food and more! Thank you so much for linking up with Impress Your Kids! I am literally on your site right now b/c I'm printing off the resurrection set to color w/the kids. Thank you for the great GREAT ideas! I can't thank you enough for your ideas for my first year teaching Faith FOrmation. Thanks! Thanks, Lacy for the Resurrection Rolls recipe! We are going to try them for our egg hunt on Tuesday with our friends! They seem a lot easier than the cookie one. Love this site and keep coming back for the terrific ideas! More exciting ideas as usual. I had fun seeing your napkin rings, but as you warned – I'm out of ink! I honestly think I have more fun with these crafts than the kids! I’m so happy to have found this. The internet lacks the kind of things you share. Hey! I went back and read your Easter Basket stuffer post and wanted to share that the religious stickers are at my Dollar Tree this year- except the Stations of the Cross and Rosary ones… the two I really wanted… I bought a package of the others while they had them, though, Also, I saved my :inspirational” metal eggs from last year and plan to refill them this year. My kids didn’t really like the mints that were in them anyway. Great post! I signed up for your blog, SO glad I found you! But I never got an email with the color resurrection set….is there a way I can get that? Thank you, thank you for all you do! Please don’t stop! I use all of it with my 3 little boys! If you weren’t subscribed back then, you wouldn’t have gotten the email. They only go out once, when I first publish them. Does that mean there is no way at all to get the colour Easter calendar either? I would really love a copy of that one. I am having trouble printing the Easter Cookies recipe and story. Am I doing something wrong? I clicked like on facebook and I can get to the download page but I’m not able to print it up. Thanks for sharing all your wonderful ideas. The download is working, not sure why you’re having trouble. ??? Tried to come to this site yesterday but it was down, almost cried thinking it was gone. Never go down again. I don’t know if I could take it. Love ya! Thank you so much for posting your inspiring ideas! I am always looking for kid-friendly ways to point our grandchildren to Christ! Your ideas & free helps are very much appreciated. I have printed out the “resurrection set.” I was going to purchase one (I saw in a magazine) this year, but yours is going to be so much more meaningful, as my Grands will be coloring it & we will be making memories as we do the craft together. May God richly bless you for sharing His creativity with the masses! Thank you, again. Lacy- you kind of spoiled me with your AWESOME ADVENT and CHRISTMAS planner that now I feel a little lost in these final weeks of lent/Easter. I’m in line for the LENT/EASTER planner…yes, I’d pay… just saying! 😉 Thanks for being a rockstar Catholic Mom who enjoys the joy of our faith. Hahah! Love this! I wish I had finished it sooner, but then again, finishing it sooner might have killed me. lol. Thank you so very much for sharing your Catholic faith with all of us. As a cradle Catholic I feel like there are certain things I should already know about and believe but it never ceases to amaze me how much I can learn by doing these activities with my children. You have renewed, strengthened, and made me see my faith through child-like wonder! Thank you! Happy Easter! I just made the resurrection peg dolls and they came out great – thanks! Do you have a resurrection story that goes along with them? I have the resurrection story from the toilet-paper roll Easter set you made in 2011, but you included more “characters” in the peg doll set and I’d like to be able to include them all when I tell my little ones the story. Thanks!